M2 is a company that ports and reissues hit games of years past, a very trusted company within the industry. As a company, they’ve been involved with many Sega titles, and have a long history with the Mega Drive. We ask Naoki Horii, president of M2, about the allure behind Mega Drive titles, and his dedication to re-releasing them! M2 energetically works on porting the Sega Ages series, and more. They’re also developing the 3DS game The Legend of Dark Witch 3: Wisdom and Lunacy, and other new titles. First of all, would you please tell us about how you established M2? (Horii) The initial members of M2 were all friends that I used to hang around in arcades with when we were students. Our love of games kept growing, and before long we wanted to try making them ourselves. There was a PC with amazing specs back then called the X68000, and we thought “If we have this, we can make games at the same level as the ones in arcades!”. Right around then we were really into Gauntlet, and were going to the arcade to play it pretty much every day. And before we knew it, we’d decided to try making a home port of Gauntlet ourselves. That was our reason for starting the company. And so that port of Gauntlet was you first job as a company, right? (Horii) That’s right. Actually overseas game companies had ported Gauntlet several times already, but they were all made under large hardware limitations. But we thought between us and the X68000, we can make a make a version that’s much closer to being arcade perfect. So when we brought the version we were working on to Tengen (they held the rights to Gauntlet in Japan at that time) to discuss it, they let us do the port. That’s really quite obsessive. (Laughs) Incidentally, why did you decide to port to the Mega Drive, and not some other hardware? (Horii) The Mega Drive and X68000 had very similar development environments. In other words, we were able to use the knowledge we gained from development on the X68000 as is. We discussed with them whether or not we could release it as a Mega Drive title, and they readily agreed to it. We were thinking about how we spent all this effort on making it for home hardware…and we were very happy when they agreed to let us do it. 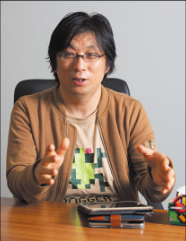 What kind of impressions did you have of the Mega Drive at the time, Mr. Horii? (Horii) I first took notice of the Mega Drive’s predecessor, the Sega Mark III. But when the Mega Drive was released, I thought “Sega’s finally trying to take over”. To have arcade games playable on a home console at basically the same level of quality really made it a stand-out piece of hardware, and I suspect there were a lot of creators that were just floored by it. There were a lot of well known games that were ported to the console, but did you have a particular fixation on porting? (Horii) The biggest reason that we kept on porting games is just that we liked doing it. And many game companies thought “We can trust M2 with this port” as a result of that dedication, so we got a lot of requests to do so. Looking at your lineup of ports, one could think that there were a lot of Sega titles in there. (Horii) The first thing we worked on was that port of Gauntlet for the Mega Drive, after all. And because of that relationship, we were able to develop for the Game Gear at that time too. We’ve also been put in charge of the Sega Ages series recently, and the Sega 3D Classics series on the 3DS. So that means you’re a child of the Mega Drive, doesn’t it? This may be an ignorant question, but what are the big developmental differences between porting and creating a new title? (Horii) In creating a new title, you get to decide what completion actually means. But when it comes to porting and re-issuing, it’s based on previously existing software. So getting it as close as possible to that original is an extremely important point. Even if you’re 99% accurate to the original, and there are just slight differences, that isn’t a perfect re-issue of the game. To give an example…there are differences in the way images are displayed on today’s LCD TVs and old CRT TVs. So it’s a matter of imitating that old way of displaying things by completely getting those differences in tone down. These are just ports, but we are talking about making “the ultimate counterfeit”. Since you’re re-issuing these titles in a perfect form, do you deliberately leave the original bugs intact? (Horii) Yes. People tend to enjoy playing those games with the bugs themselves as a part of them. By all rights, we should be fixing them when they’re ported. However, a lot of players had fun with those bugs back then. And if they’ve really taken hold, wouldn’t it make people happier to leave them in? That’s the decision that we’ve made. Unless the bug is a critical one that blocks progression, we do our best to leave them in. With all of the titles that you’ve ported, have you learned any lessons applicable in new game development from that? (Horii) Of course we put that experience to use in just about everything. Porting a game is tracing through everything that the previous person did. And as you’re doing that, scenes from the original development are unfolding before you as you realize “This person was implementing this kind of functionality by thinking about things in this way”. The more ports you work on, the more ideas you get, right? (Horii) That’s right. And in working on porting all kinds of titles, you come to realize things like “Oh, the systems in this game are obviously taking influence from this game that came out the year before”. Incidentally, is porting games very profitable? Please keep giving it your all to make sure the flame doesn’t go out on these past classics! By the way, where do you think the meaning of the existence and value of these classic titles exists in this modern era? (Horii) Of course within the games themselves, but also the environment in which you play these games has greatly changed between then and now. Games now allow a player to progress no matter how much they’ve played, in order to not waste their time. But with older games, if the player wasn’t skilled enough they would mercilessly get a game over. That may have been a bit unreasonable, but I think that there was fun to be had in being able to see your skills progress. By the way, various levels of additional content are included in the ports that M2 works on. But why is it that additional content is included when you’re striving to create “the ultimate counterfeit”? (Horii) The additional content that we include can largely be grouped into two different categories. The first is features for people who don’t have much time to dedicate to the game. For example, it might be speeding up movement in an RPG, or the ability to increase the experience that you gain from battles. The other is the addition of a “super easy mode”. The purpose of this is for those who want to be able to clear the game in the original mode to use this to get the hang of things in shooting and action games. For people who have played the original version and are playing the port for their second time around, we want them to be able to have a new kind of fun with it now…Those are the reasons we include additional content. Then for our final question, please tell us about what’s left the biggest impression on you in all of the ports that you’ve worked on. (Horii) The most memorable thing for me has been being able to work on the port of Gauntlet to the Mega Drive. It made us so happy that we added modes that we weren’t even asked to, even though it ended up taking us around two and a half years to develop (Laughs) And I’m very grateful to Tengen for letting us do that port, and to Sega for making the Sega Tap/Team Player (four player adapter), that I can only think was done for Gauntlet.